Finding reputable health information online is no easy task. Do a search for "medical research" on google and you'll get 101 million web pages. 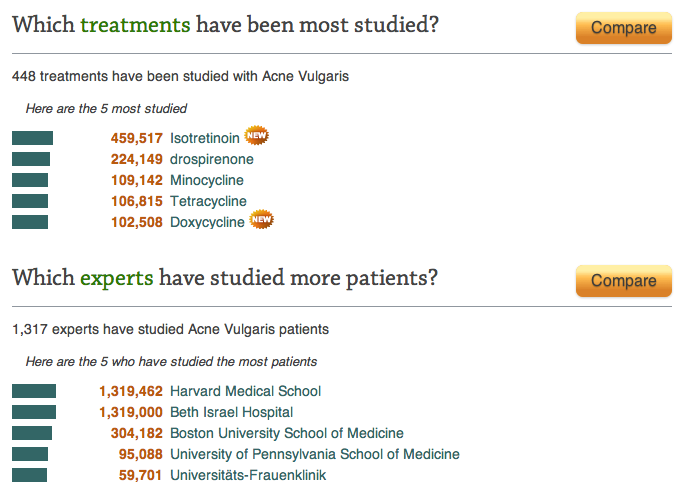 Narrow it down to a disorder like "acne medical research" and you still get 3.5 million hits. Medify believes they have an answer. Their website aggregates data from well-known research facilities like the National Institute of Health and then extracts key information from research articles to create an organized, easy to understand summary page equipped with interactive graphics. From there, users can quickly compare the thousands of research articles by a number of variables. Take our example of "acne." Medify identifies that 448 treatments have been studied for acne vulgaris by 1,317 experts. 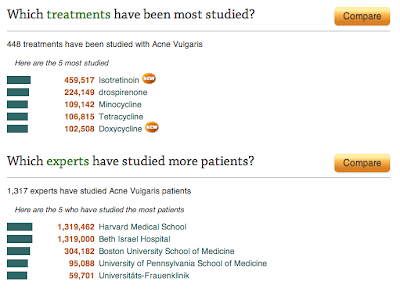 It also displays the hottest research topics on acne vulgaris and a list of newly released patient studies. A powerful feature of Medify is it's charting tool. From our acne vulgaris search, clicking over to comparison shows us a graph of current research based on their strength of evidence. Medify determines this strength by an algorithm which takes into account factors such as progress in clinical trials, number of studies, and number of patients. 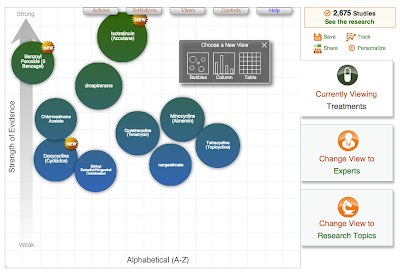 Users can further personalize their search with demographics or adding more search terms. The company started in private beta in April 2011 and launched publicly on August 16. The company is led by Derek Streat, a motivated father frustrated by dense lists of articles pertaining to his daughter's rare illness. Medify has an impressive list of advisors including doctors from ADAM, United Healthcare, McKesson, and Healthgrades. The company recently received $1.8 million dollars in Series A funding from angel investors and Voyager capital. For more information, go to http://medify.com or head to the Health 2.0 conference in San Francisco this September where Medify will be appearing. Dr. Thuc Huynh is a physician and webpreneur. She is the founder of Scrubd.in, a medical mobile apps shopping site and MD Salaries, a website reporting physician salaries for every specialty. She is also chief operating officer of Scutwork.com, the leading website for residency program reviews. Her main interest lies within web and mobile technology for medical education, patient empowerment, and patient care. Dr Huynh graduated as chief resident and teacher of the year from her family medicine residency in Rapid City, SD. She received her M.D. at the Medical University of the Americas.